The incidence of triplet and higher-order multiple births rose fourfold during the 1980s and 1990s. This rise was associated with older maternal age and the increased use of fertility-enhancing therapies and was of concern because of the greater risk of adverse outcome of triplet and higher-order births compared with singletons and the added toll of these pregnancies on maternal health. Since 1998, however, this trend has edged downward. An NCHS report explores the recent downturn in triplet and higher-order births by maternal demographic factors. The triplet and higher-order birth rate declined 41% from 1998 to 2014, or from about 1 in every 515 births in 1998 to one in every 880 births in 2014. Triplet and higher-order birth rates were down by about 50% or more for women aged 25 and over. Rates were essentially unchanged for women under 25. The largest declines in triplet and higher-order birth rates by race and Hispanic origin for 1998–2014 were for non-Hispanic white women, down 46% compared with a 15% decline for Hispanic women, and essentially no change for non-Hispanic black women. 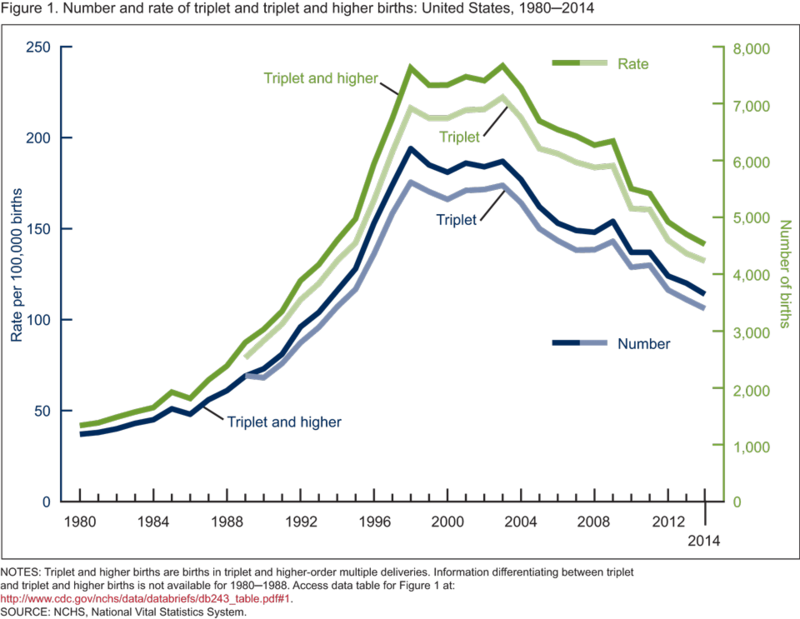 Triplet and higher-order birth rates were down from 1998–2000 to 2012–2014 in 42 states; declines of more than 50% were observed in 7 states. This entry was posted on Thursday, April 28th, 2016 at 3:12 pm and is filed under Births, multiple births. You can follow any responses to this entry through the RSS 2.0 feed. You can leave a response, or trackback from your own site.